A prime example of social media marketing: Quality Hunters - Harold Tor. 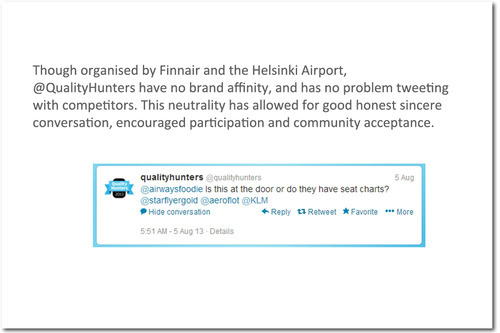 For the third year round, Quality Hunters is a community conversation exercise jointly organised by Finnair and the Helsinki Airport. 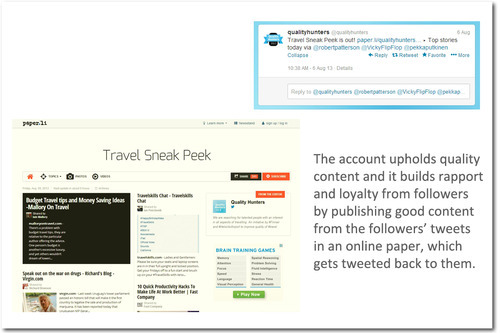 It has a website (which houses a blog www.qualityhunters.com), a Facebook page, a Pinterest page and a Twitter account. “So what?”, you ask. Well, it is not the channels they use, but the way they use it and what they use it for. When you look at their Twitter account, you see that they are a prolific tweeter: a total of 16,038 tweets (at the time of this writing). They follow 1958 people and are followed by a mere 2150. 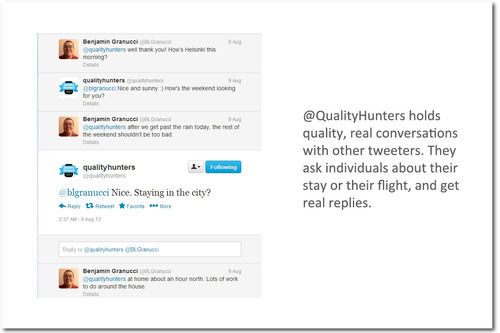 But what is remarkable is the amount of quality, real conversations that the Quality Hunters hold with other tweeters. They ask individuals about their stay or their flight, and get real replies. They hold Q and A sessions with the community about topics like Sustainability and travel, or Admirable local community projects, through the hashtag #TTOT (Travel Talk on Twitter). They publish quality information from the tweets of their followers in the form of an online paper, and then tweet it, so as to promote good content shared among the community. This is the aim of a Twitter engagement, not the tens of thousands of followers some brands or some managers aim to own or what some agencies aim to sell to you. When you run through the tweets, not once were Helsinki airport or Finnair mentioned. Both are the organisers of this exercise and both brands are completely invisible. The reason: they are not there to hard-sell, they are there to be part of the community. However contradictory or counter-productive this may seem to you, this has tremendous benefits for both companies. First of all, they would seem insincere to the community if they present themselves as the brands themselves. Two, the conversations will turn into a major moaning ground for dissatisfied or unreasonable customers (there are the Twitter accounts of both companies for that purpose), instead of having a good quality conversation on what can be improved or what can be changed. Thirdly, the conversation will be on quality air travel in general not about the airlines or airports separately, because air travel is one whole coherent experience for air travellers. All other airlines or other airports in every other country can feel free to join in. It is an inclusive conversation, and that is what makes it interesting and fun to take part in. Once you’ve chosen to be part of the community, you have to speak its language. No corporate talk or fake polite customer-service voice. The personae of the Twitter account is an air travel enthusiast He/She does not hesitate to use #FF, smileys or CAPITAL LETTERS. He/She speaks simple, plain English. He/She knows what topics fellow members like to talk about, such as #qhdiscussion or #longhaul. He/She has no brand affinity, and does not hesitate to talk to or retweet other airlines or brands (such as @aeroflot or @KLM). It takes a whole lot of courage to do this, and it shows Finnair and Helsinki Airport are run by truly open-minded people who are willing to shed their corporate shells and take risks to reap the benefits. It also takes a lot of balls (pardon my language) to be open to change, even if it points to your nose that you are creating an inconvenience to your customers or you are the one who put in place a bad idea. That you are willing to take the blame for what you have done, and make the change and improve your service to your customers. Few companies dare to make this move and even fewer top managers dare to be confronted with their own mistakes. “Why do this?”, you ask. The feedback is honest. You may think you know what your customers want, but it often surprises you that there may be other things that they expect of you. As was mentioned before, the conversation will help you identify mistakes and correct them, as well as learn from the best so that you can emulate the solution in your own company. By speaking the language of your customers and talking about the things that interest them, makes you part of the community. You gain not only insight, but also their respect, and this builds a bond between you and your customers. It sounds almost ironic that when you do not mention your brand, your brand image is enhanced. That’s right. It is well-known that Finnair and the Helsinki Airport are founders of the exercise, and because they have kept themselves neutral, their brand image is enhanced through what is perceived as a sincere and honest undertaking by both companies. I hope the above analysis has provided you with some food for thought. Social media marketing is not marketing in the strictest sense. It is about genuine conversation with the community you are serving. It is a meaningful dialogue, a two-way communications. You gain through the insights you get in these conversations, not by hard-selling or by showing off the number of followers you have. It does not have an ROI and no matter what they say, you can never establish a direct link between the number of followers and a dramatic increase in sales!